AGES: Grades 3-5. Grown-up support and encouragement is advisable to get the most out of this kit. It may be possible to do this with a younger child, depending on interest and ability. GIVEAWAY: Win the Gears set! It's Super Cool! U.S. Addresses Only please. Sorry to my northern neighbors. When it comes to building, Number 1 Son seems to have hit a plateau. He hasn't moved onto the baby engineering sets like I thought he would. He may have dabbled in them but I feel he is just a step above being acquainted with serious building. And that would be fine but I know him - the desire for more is still there. However, it appears now that the only thing he wants more of is the buying of more pre-designed sets. At this point, it seems like it is more about collecting all the cool pieces and licensed character sets and less about building and engineering. But what is a mother to do? Even if I tell him that I will buy him no more of such sets, that still only solves half the problem. When he masters a certain level of building, he has to move on but sometimes the emotions and confidence do not follow suit. I think many parents see this in their children and so they try to help their child by providing more difficult projects but instead of leaving them on their own, they stick around - sometimes to assist, sometimes to teach, and sometimes just to say nothing but be there "just in case." I know that grown-ups are all deserving of a break and toys should provide some sort of leave-me-alone-insurance to parents. 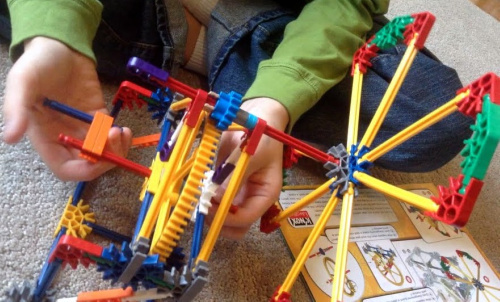 I totally agree but I have to say that after becoming acquainted with the K'nex Introduction to Simple Machines sets, I am so glad that I chose to be an assistant, a silent cheerleader and teacher. I have seen that with the help of these sets, my son is able to learn basic engineering and that the level of difficulty can be mediated in varying degrees by a grown-up. What does that mean? K'nex is challenging but not so challenging that even a know-nothing like me can still be useful enough to help guide him to reach this next very ambitious level. So if you buy this for your child and he shows little interest and all he wants to do is dive into his stash of loose Legos or K'nex and make things that looked like things he made last year that even he is boring his own self, do not dismay! 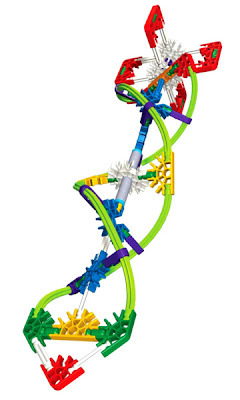 I've been there and if you really feel your child is ready then just break open that K'nex Intro to Simple Machines set (all three are great!) and start building the stuff yourself. (If you build it, they will come.....) And he did!! and then he made amazing things!!! You see here that there are two sets of instructions. The B/W guidebook that you print out from a CD inside the kit (VERY informative) or you can use the Cliff's Notes version with little words and lots of color. Thanks for giving us both options! Top Teaching at a Fair Price. Do not compare this to the 50 Model K'nex Classics building set ($34.99 MSRP) that looks very cool. Yes, there are 300 pieces and the largest of the machines set only has 221 pieces but if you are shopping by the piece then you will be doing yourself a disservice because the teaching is the real draw here. Whether you are using the colorful and brief booklet or the informative guidebook that provides a fully descriptive lesson according to the type of gear or pulley or axle being investigated - one thing is clear: It's all about machines. There is no room for distraction. By the way, it is not easy to find this kind of instruction at this level and at this price. Trust me, I've been looking and looking. Colors not only make it inviting but all the different sized pieces come in a specific color. That way, kids can easily follow the directions. So smart! From the Gears set. I think the hope is that maybe our kids will learn more and more so that they can start seeing things as a whole structure. Looking at the images in black and white helps us with that after we've finished building it. 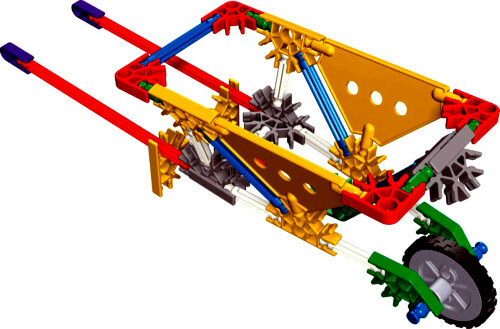 K'nex Classics Focus on Structure. Normally, I prefer it when blocks are uniform in color. David Wells, Manager, Creative Making and Learning, New York Hall of Scienceonce told me that when blocks are a uniform color, you can really see the structure. 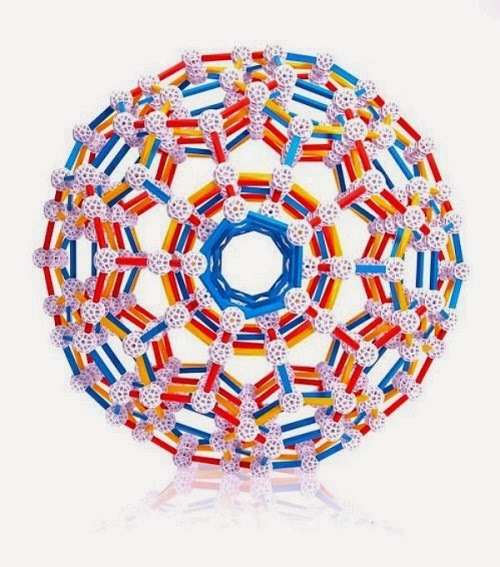 I totally agree but the one great thing about the K'nex Classics pieces is the each rod or connector piece has a specific color assigned to it. There can't be more then 15 different shapes and so it becomes easy to find which pieces you want so that you can keep the building flow steady. The pieces are also bigger so that the main challenge remains at the engineering and need not be a fine motor or visual discrimination challenge added on just to make you crazy. Basics are Basically Fun. None of the sets include motors but I think that when your child is ready, you can probably buy one to use for some of the models in the sets. It definitely is not a requirement and I would suggest that if your kid really wants one, then let him wait a little. If you see the video of the fan then you'll be able to see how a motor used a bit too early could steal the thunder of the initial discoveries to be made. 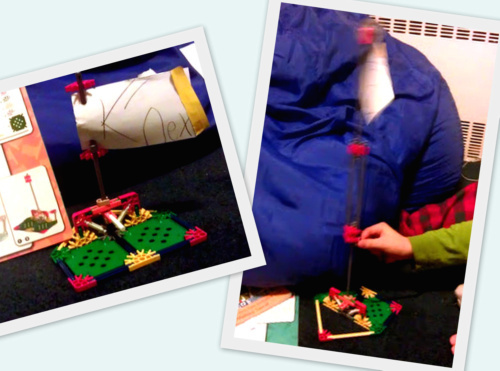 I was so happy to see how he learned how to make modifications from the set but also from his own ideas. Still, motors are cool and so I think he'll be getting one someday. OOOOH! And one more thing! If you homeschool or are very serious in providing real lessons about these concepts, these instructions book inside the CDs in each of the sets are very informative. 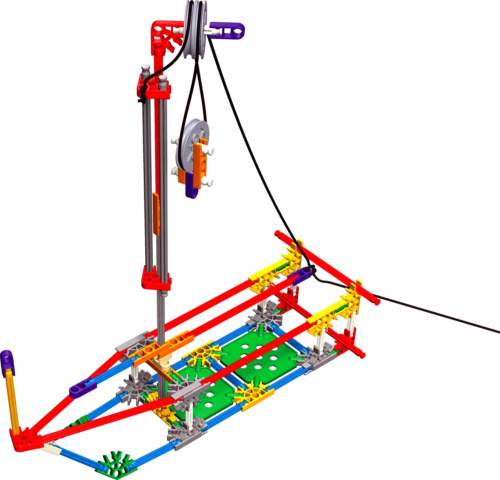 Read here about how K'nex creates their sets with national education standards in mind. I think he was daunted by this one (the well) and so one day, I just said I would make it myself.. He took over after I finished 25% of the job. I had a feeling he would! In Wheels, Axles, and Inclined Planes. He modified the "bucket" to make it fit the shot glass because a heavy bucket could collect water. Shot glass nor mention of a shot glass is not included, okay? I wonder if pouring blue water into a bucket in the middle of the living room carpet was the most fun part. Now that he knows how to make one, can you imagine that it can be a part of a play scenario or perhaps even a science project.... you never know!!!!! 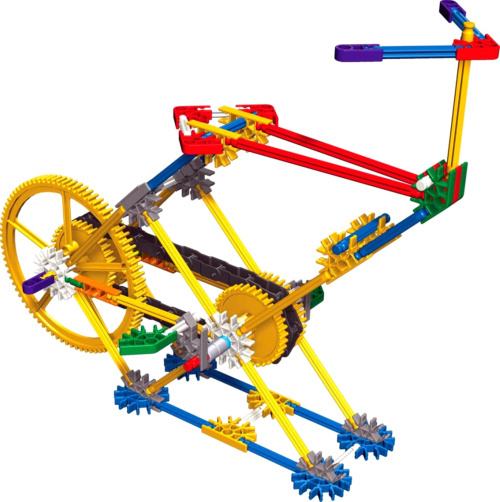 And now here's your chance to win your very own K'nex Introduction to Simple Machines: Gears set! Hooray. This raffle will be really simple. Hope you all throw in your hat for this. 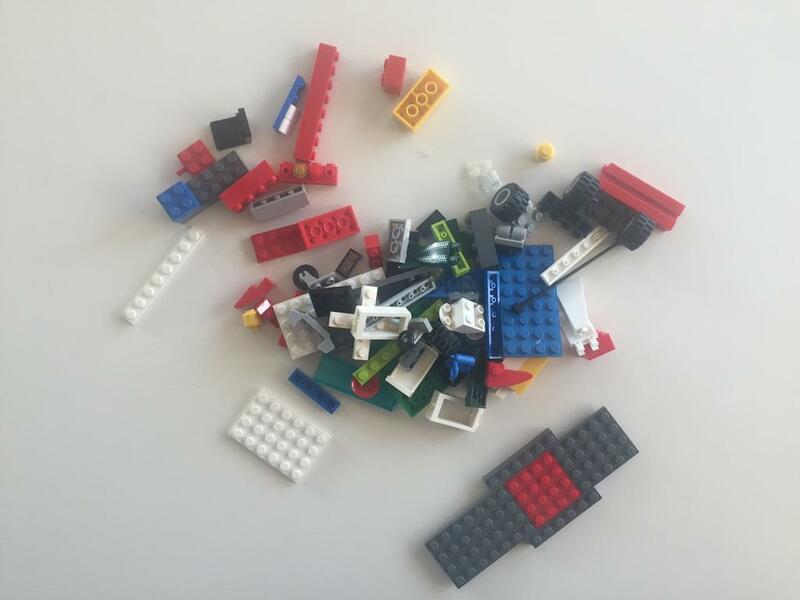 Even if your child is not a fanatic builder, I think being acquainted with this will help children more easily understand what makes things work. Want to get all three??? Try my Amazon link and support thoughtful toy reviewing in 2013. I do not like that many building sets come with directions. I want my son to create his own designs (and have a set that comes with enough pieces to do so). Like with snap circuits, he never deviates from the book- he does the company's plans and does not experiment (and learn from mistakes). building sets today are awesome compared to what was on the market when i was a kid. 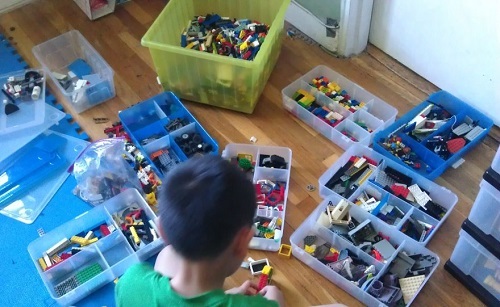 i think legos are great, as long as kids follow the directions AND free-play. my toddler is into wooden blocks rights now. the simplicity of that is magical. Some are just way too tiny and they are thinner and made more cheaply.